About 26 miles (42km) northeast of Athens, between the villages of Nea Makri and Marathona, is the site of the great battle between the small force of Athenians and the mighty Persian army in 490 BC. 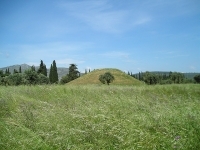 On the plain of Marathon today the burial mound of the 192 Athenians who fell in the fight can be seen, along with a small museum displaying archaeological relics from the battlefield. The battle is famed not only for the Athenian victory against huge odds, but also for the fleetness of the Athenian runner, Pheidippides, who was dispatched to Athens with news of the victory and fell dead from exhaustion after delivering the message to the city; thus the name 'Marathon' was given to long-distance running races. The marathon race in the 2004 Olympics started here, and followed the same route as that run by Pheidippedes in the legend, ending at the Panathinaikon Stadium in Athens, which was built for the first modern Olympic Games in 1896. Marathon remains one of the most famous battlefields in the world and a visit to the site is a must for anybody with an interest in military history.